As much as I adore summer, days of 40+ degrees pose something of a challenge. How to stay cool and still retain even a semblance of non-sweaty elegance? Wear a dress made out of a tablecloth, of course! You might recognise the fabric from my Singapore trip a couple of years ago. It turns out there’s quite a bit of material in one tablecloth – I still had a lot left over! I’d been trying to work out how to maximise the embroidery and the edging, both because the edging is such a pretty detail and because if I can get out of finishing a seam the fiddly way, I will. Turns out that making the side seams a design feature addresses both these issues. I used a simple shift dress pattern to work out the rough shape of the dress and cut two pieces each for the front and back with the raw edges forming the centre front/centre back and the embroidered edges along the sides. When cutting, I positioned the pieces so the embroidery met neatly in the middle and made the centre seam less obvious (although you can still see it in this photo). I created the bust darts and then, instead of sewing the right sides together and turning the dress inside out, I sewed the wrong sides together and left the edging as a kind of large frill down each side. I like the way the frills add a bit of interest to the silhouette, which you can see more clearly here. Apart from general laziness, I had another reason for doing as little sewing as possible on this garment – the embroidery is extremely thick, so if the seams had been made in the usual way there would have been quite a bit of extra bulk on the inside. 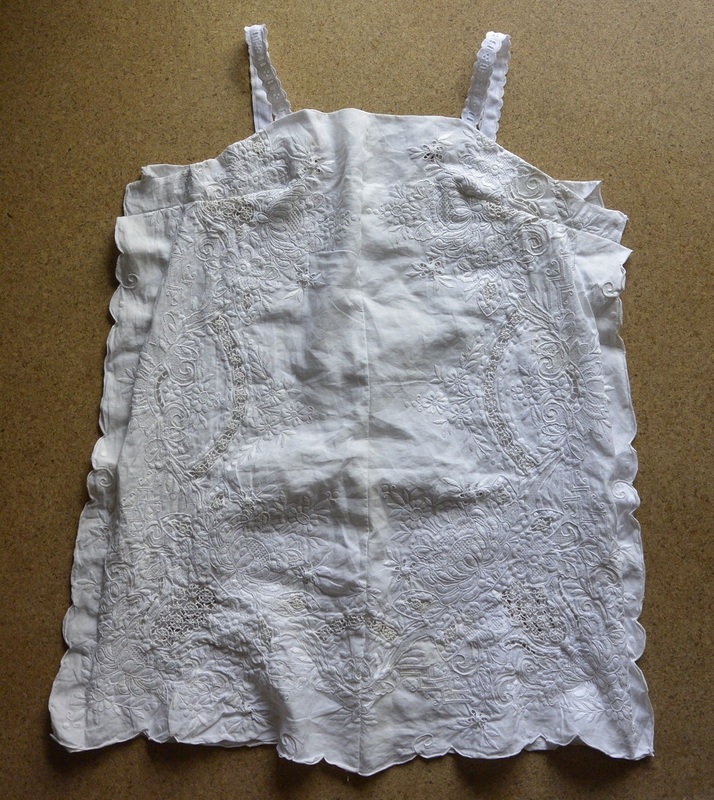 Rather than making the shoulder straps from such thick and uneven material, I sewed strips from white fabric left over from a dress with which I’ve since parted ways and then stitched broderie anglaise trimming over the top (I didn’t trust the broderie anglaise to be strong enough on its own). The first dress I made from this tablecloth travelled to Singapore, and this one went on holiday too, but it was more of a staycation with a little old lady (one I first mentioned here and who is always happy to see me). Hopefully it will get a bit further afield before long as I’m planning to travel overseas sometime this year. And when I do, I will be non-sweaty and elegant, thanks to this dress. Non-sweaty elegance is the dream! This dress truly embodies that dream – it looks gorgeous.